Dentistry is a physically demanding profession. Dentists often assume awkward positions to provide treatment to their patients. This leaves them at high risk of developing musculoskeletal disorders (MSDs). MSDs are a common medical problem and include carpal tunnel syndrome and hand-arm vibration syndrome. The causes include repetitive work motions, awkward or constrained postures and the use of vibrating tools. A cross-sectional study conducted in 2013 found that of 170 dentists in different specialties, 73.9 percent reported musculoskeletal pain. Most of their pain sites were the neck and back. In another study of 60 dentists, 90.5 percent of participants had a mild to moderate level of severity for lower back pain. Of that group, 57 percent reported taking a break during rest hours; only 17 percent exercised during that rest period. 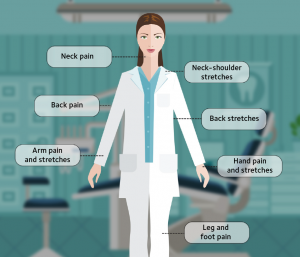 A good, ergonomically designed operatory, along with daily stretching and exercising, can help dental practitioners enjoy long, healthy careers. The ADA’s Center for Professional Success has an entire section dedicated to all aspects of wellness in your dental practice, including ergonomics. give safety tips on avoiding hearing loss. There is also a series of ergonomic videos that will show stretches you can perform in the office daily. These short ergonomics videos demonstrate stretches for your neck, hands, arms and back. The Center also provides printable posters showing quick stretches you and your staff members can use to improve your physical health. A dentist can spend up to 60,000 hours in a lifetime working in uncomfortable positions that lead to MSDs. Take care to prevent causing or exaggerating injuries in your office so that you can practice successfully and live well. Go to Success.ADA.org/Wellness for these resources and more information. This article is provided by the ADA Center for Professional Success. The Center is an interactive Web portal that provides practice management content and decision support tools with the goal of helping members practice successfully, learn conveniently and live well. Visit the Center at Success.ADA.org. Editor’s note: This article was originally published in the Summer 2017 issue of Dental Practice Success.